Home ELECTIONS Can vengeful Mugabe shipwreck ZANU-PF? Can vengeful Mugabe shipwreck ZANU-PF? ROBERT Mugabe is voting for the opposition. In a manoeuvre that no-one could imagine just ten months back, the deposed strongman has thrown in his lot with the Movement for Democratic Change, a party he repeatedly vowed would never be allowed to take power in Zimbabwe. In a calculated assault on his former ZANU-PF allies and the military which had anchored his rule before turning on him last November, Mugabe called a Sunday press conference to declare that he would be backing MDC Alliance leader Nelson Chamisa in Monday’s election. “I cannot vote for those who have tormented me,”a slouching Mugabe told journalists gathered around a pagoda-shaped structure on the edges of his vast Borrowdale estate. While emphatic about who he was not going to vote for, Mugabe was initially circumspect about who would get his vote. Saying he would take his pick from the other 22 presidential candidates, Mugabe rolled out a few names as if to mask his preference. “I worked with Mai Mujuru, I worked with Mai Khupe. There are other names I’m reading for the first time. There is Chamisa. I have not worked with him. I have seen his work with his former leader. I lie, I worked with him in our government of national unity,” Mugabe said, appearing keen to reveal his choice. Pressed further by journalists and openly cajoled by his wife Grace, alternately a ventriloquist and cheerleader, Mugabe twisted the knife. “I can’t vote for ZANU-PF. I can’t vote for those in power, who are the people who have brought me into this state,” he drawled, encouraged by Grace to ‘speak up’ each time his voice trailed off. With no hint of irony, Mugabe said he pined for a “return to democracy and constitutionalism”, which he said disappeared with his ouster. It did not, however, take long for Mugabe’s egocentric streak to show as he moaned about a leaky roof on his oriental-style mansion, built on 10 hectares and his $467,000 pension. 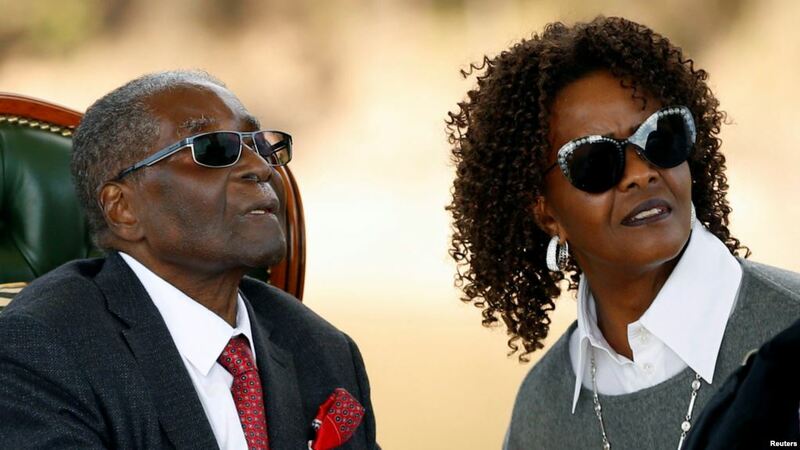 With his wife helpfully chiming in to spell out ‘four-hundred-and-sixty-seven American dollars’, Mugabe sounded like an average Zimbabwe pensioner wallowing in penury on an $80 monthly pension. The 94 year old, who described the prospect of marking a ballot paper which does not bear his name as ‘painful’, hopes his endorsement of Chamisa can tip the scales in a tight race. The rural vote, 67% of total voters, is, as usual, going to be decisive in this election and Mugabe is believed to retain some support in the three Mashonaland provinces. Almost five years ago, to the day, the former president addressed a press conference on the eve of the 2013 general election, hoping to regain the narrative from an opposition he feared had seized the initiative. The 2013 press conference was hastily arranged in response to Morgan Tsvangirai’s massive ‘cross-over’ rally held in Harare two days before polling day. With campaigning now officially outlawed within 24 hours of election day, Mugabe and his strategists decided to hold a press conference where he would project confidence, while carefully steering clear of campaigning. Mnangagwa sat next to Mugabe at the 2013 press conference, prompting a journalist to ask if Mugabe was parading his chosen successor. On Sunday, Mugabe painted his former lieutenant as a dishonest grafter whom he regretted keeping close for long, as he sought to hand the initiative to the opposition.